Q: Can share Idemitsu's OLED material performance? At SID in 2015, Idemitsu presented new fluorescent blue materials that reduce the power consumption of blue OLED devices by 25% or more(3.0V, CIEx: 0.137, CIEy: 0.053, L/J: 7.3 cd/A @ 10 mA/cm2). Q: Idemitsu is collaborating with UDC on phosphorescence materials. Do you have any updates or estimates as to when can we expect a blue PHOLED on the market? Idemitsu thinks that it will still take considerable time to commercialize phosphorescent blue OLEDs. On the other hand, Idemitsu is looking at the possibility of using thermally activated delayed fluorescence (TADF) materials as an alternative technology for high-efficiency blue OLEDs. Q: Can you tell us more about Idemitsu's views on TADF emitters? Like phosphorescent blue, TADF is a difficult technology. However, Idemitsu thinks that TADF materials are more likely to be commercialized in the next several years. Idemitsu believes that high-efficiency blue technology is a key to developing the OLED market further, not only in the display field but also in the field of lighting. Idemitsu has been working in the TADF area for several years now, and Idemitsu has basic TADF patents. Idemitsu considers TADF as one of the key OLED technologies on which Idemitsu intends to focus in the future. Q: Can you tell us of any OLED makers or OLED products that employ Idemitsu's materials inside? Of course, Idemitsu cannot disclose the details of its customer’s OLED panels. However, we can say that Idemitsu considers LG Display as Idemitsu’s most important strategic partner. Idemitsu also has strong collaborative relationships with AU Optronics in the field of OLED. Q: Idemitsu holds 33% in Global OLED Technologies, the IP firm that holds Kodak's original OLED patents. Is GOT a strategic holding for Idemitsu? Idemitsu transferred all its shares in GOT to LG Display in 2015. Idemitsu’s investment in GOT had accomplished its originally-intended objectives, so the investment was liquidated. Q: Recently Idemitsu signed an OLED material business agreement with Doosan. Can you explain this new agreement? What kind of technologies do you aim to gain from Doosan? Doosan owns important patents covering certain phosphorescent green and red OLED materials, as well as transport materials. Idemitsu has a strong patent portfolio covering a variety of OLED materials, including fluorescent blue materials. Idemitsu appreciates the mid-term development capability of Doosan and believes that both parties can leverage their respective strengths in OLED technology through this cooperative relationship. Q: Can you update us on Idemitsu' cooperation with LG Display and AU Optronics? As mentioned earlier, Idemitsu has a continuing collaborative relationship with LG Display as Idemitsu’s most important strategic partner for both OLED materials development and future business. Idemitsu also is continuing to support AU Optronics with its further growth in the field of OLED, with close communication utilizing Idemitsu’s office in Taiwan. 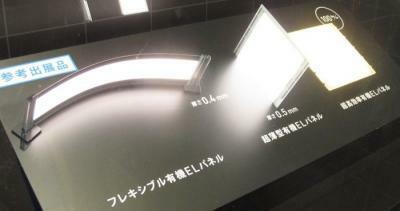 Q: In 2011, Idemitsu launched an OLED lighting production company (PIOL) together with Panasonic. The company was later dissolved. I wonder if Idemitsu can shed some light on that decision? Why did Panasonic choose to quit the OLED lighting market? PIOL manufactured OLED panels and marketed those panels for lighting. PIOL was dissolved because both Idemitsu and Panasonic decided that it will take considerable time to start a full-scale business in the field of general OLED lighting. Nevertheless, according to their original plan of establishing PIOL, Idemitsu and Panasonic were able to confirm a potential demand for OLED panels in the field of specialty lighting. Q: What are Idemitsu's views on the OLED market going forward? Can you share your company's estimates for the next 5 years or so? Idemitsu is expecting that the OLED market will expand at an accelerating rate over the next five years in the area of mobile products as well as in the area of televisions. By collaborating with other material makers through alliances such as the one with Doosan, Idemitsu expects to be a key participant in further expansion of the OLED market. Thank you again for this interview, good luck to both you and Idemitsu!